Yesterday we dodged raindrops to pick up a monster chocolate chip cookie from Jacques Torres. I thought this was the one Hong said we must try but now I think I'm wrong. Hello, lovely ladies who lunch! I follow your blog everyday, and admit to being secretly jealous of your daily lunching adventures. For the most delicious, chewy, moist and chocolately chocolate chip cookie, you must try out Paradis to Go, on 12th and 4th avenue. 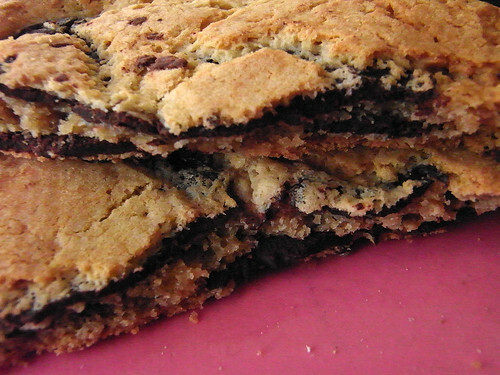 I swear you will both love it, from one chocolate chip cookie lover to another! Also, I think your friend was referring to the chocolate chocolate chip one! Enjoy! One of us lives right there, we will definitely pick one up on the way to work soon! that's the one!! it's like a huge slice of chocolate in the middle. but aren't the edges delicious with the perfect amount of salt?